Customized plans for 2019 & 2020 wedding dates! Select a plan customized to your wedding month! From June 2019 all the way to 2020. Accelerated & Extended plans now available! Enjoy one of a kind Themed Boxes throughout your wedding planning journey. All plans can be cancelled any time, no penalties or fees! Depending on your wedding month receive Themed Boxes that are aligned to various stages of planning from Engagement to Honeymoon! 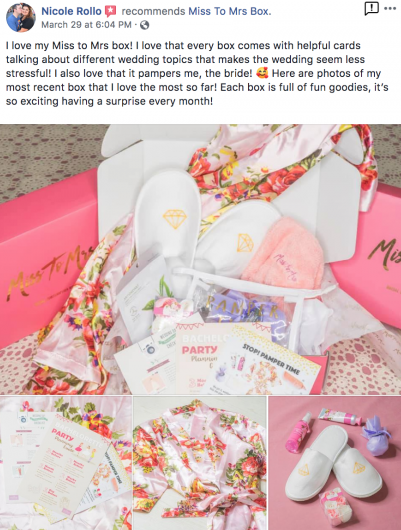 JOIN THOUSANDS OF BRIDES-TO-BE WHO PLAN THEIR WEDDING WITH MISS TO MRS BOX! 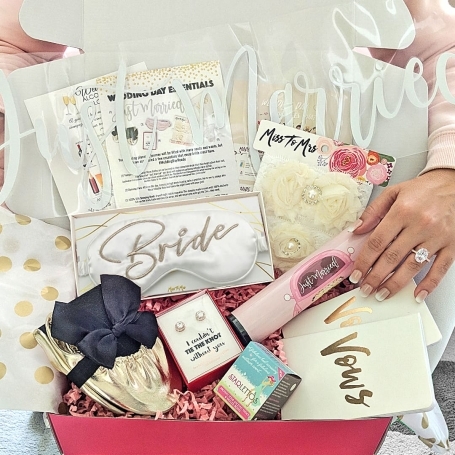 Brides already enjoyed trendy & beautiful wedding themed gifts, planning tools, bridal apparel, decor elements, wedding accessories, bachelorette party / bridal shower essentials, wedding day essentials & lots more. We frequently update our themed boxes to be on trend with latest must-haves! Most of our subscribers said they either used, or will use, ALL the products they received! PERFECT PLANS FOR 2019 and 2020 BRIDES. EXPLORE THE OPTIONS TODAY! COPYRIGHT © 2017-2019 Miss To Mrs Wedding Gifts Inc.